Product #1819 | SKU 393 | 0.0 (no ratings yet) Thanks for your rating! 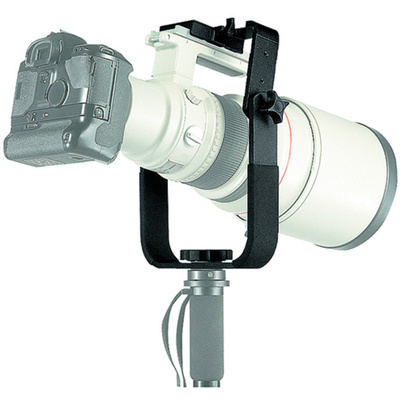 The Manfrotto 393 - Long Lens Monopod Bracket puts the tilt axis (up/down) in line with the midpoint of the lens' weight. This makes movement with a large telephoto lens easy enough to be done with one finger. Point the rig where you want, let go and it stays where you left it. Height of the lens is adjustable and there is a built-in pan base. The built-in 357 quick release assembly allows fore/aft movement within the mount for perfect 50/50 weight distribution. The 357PL quick release plate includes two 1/4"-20 screws (many large tripod collared lenses have two sockets in their collars) and one 3/8"-16 screw. The 393 is appropriate for all telephoto lenses with a tripod collar.